This card stands for the achievement of a significant interim target. 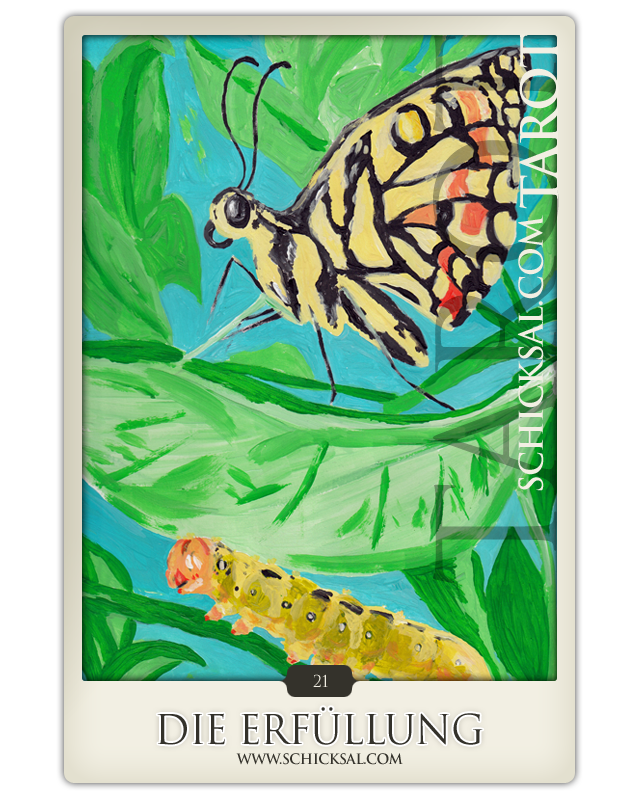 This tarot card shows a butterfly. At the bottom of the picture there are leaves – upon them is shown a caterpillar. This image of an insect represents the process of our own development and that gift that was given to us as life. The aim was achieved. This card stands for the achievement of a significant interim target. Correspondingly with the card relief now – after the journey the goal has been achieved yet. This process of sublime has already begun before and meanwhile it is composed. But, however, the journey of initiation still goes on – further and further. But how many paths could have been chosen? The card shows as well that we are placed in our life and so far we did learn from the past. Meanwhile we did come to know what our life is worth and consider the values attending us and support us. We achieved happiness and we are in balance. The balance of power and strength supports to handle the opposites between the various contradictions of life. You made experiences by the material world and the immaterial world. The emotional part in life could be saved - such a sacred correspondence between heaven and earth – the world and the sensitivity which was achieved now. The insight that gives you reason to be in the midst of all things. But furthermore it still continues to hold the line - to keep it and to take care for it that the gifts and presents are saved. Fulfilment is a sensation to catch our dreams and to keep them in our hands. The negative aspect of this card fulfilment stands for a warning likewise to be not too ambitious and set achievable and reachable goals for the future. We are on our way equally it is risky and dangerous to keep balance in life. Consequently the balance of power flows into disorder. Please, be on your guard! You should try to behave vigilant about your life and your decisions. If nothing works you feel stagnation. Relationships of any kind, it is not important whether friends, fiancés, partners, family or further relations – any kind of them has its unique significance. They are marked by love of live, inspired energy, long-lasting effect, harmony and balance. Regarding singles this card fulfilment could symbolize happiness in life and equally bliss of love. Thus this card represents a new love affair, acquaintanceship, maybe the soul mate. The tarot card fulfilment shows our profession must have been your destination. Or, equally on the contrary you discover ways and worlds to your destination and achieve what you are bound for. A lot has been achieved and actually there are ways and parts to fill and by the way it is much more than means to an end. Projects and tasks are purpose and it is in your hand to put an end. The card fulfilment has a high value. It is positive and shows that you are on the right way. Maybe today you get the chance or opportunity to achieve something significant or even you achieve a desired goal. You sense in the midst of all things and it perceptible for people around you. You are inspired by love of life and you stay in balance.